Our fleece dressing gowns come in an amazing range of bright, colourful fleece patterns suitable for both men and women. The dressing gowns are approximately 45"(113cm) in length as standard. Each fleece dressing gown comes with two side pockets. You can lengthen or shorten your dressing gown to get the perfect length making them ideal for tall and short people. 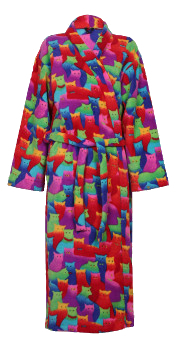 Try our new custom dressing gown designer for your perfect fleece dressing gown.